The trail to Medicine Grizzly Lake breaks off from the Triple Divide Trail where it alternates between open, subalpine fir forests and avalanche chutes. These avalanche chutes are filled with flowers from spring to mid-summer. They are also a fantastic place to spot moose, so take the time to look for them. All along the way, the tall rocky walls of the surrounding mountains create a wonderful and breathtaking cathedral. Halfway from the junction with the Triple Divide Trail and the lake, a huge meadow breaks out. It can be marshy in a few areas, but the wildflowers are stunning with the rugged backdrop. A few more avalanche chutes, and you reach the outlet of the lake. The lake is crystal clear and jumping with fish. It is fed by numerous waterfalls off of Razoredge Mountain with the sound echoing throughout the valley. Follow the trail along the north shore all the way to the head of the lake and enjoy lunch next to one of these feeder streams tumbling from snowfields thousands of feet above your head. This content was created by Jake Bramante of Hike 734. Visit hike734.com for more expert Glacier content and maps that help you decide which trail to hike. Numerous wildflowers including arnica, fleabane, beargrass, columbine, spiraea, etc. Small mammals such as tree squirrels, marmots, and golden-mantled squirrels. Keep an eye out for moose in the avalanche chutes, bighorn sheep in the alpine meadows above, and mountain goats climbing around in the cliffs and meadows above the lake. Bears are also a possibility, so keep your eyes peeled. 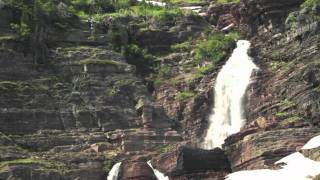 Trip video of Medicine Grizzly Lake. Flower meadow before Medicine Grizzly Lake.